Besides all the standard hoopla that comes with spiritual pursuits you are taught to think for yourself. Question everything. Discount what doesn’t fit. Contemplate with honesty. Then when you are faced with the impossible you have the attitude to accept or discard. 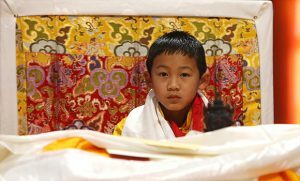 This was my mindset when I watched the Tibetan Buddhist ceremony to introduce a young boy as the reincarnation of Bokar Rinpoche. Rinpoche died on August 17, 2004 and now he has been reborn, found and brought forth. I am faced with the impossible and yet somehow it makes sense. Bokar Rinpoche was responsible for the way I studied Buddhism. His method is taught here in the west and I was an ardent student. My eventual slacking in time and devotion to the practice was more about my laziness than his death. But he, and the lamas that carried on his teachings, changed the direction of my life. So I watched this child being introduced to the world. Our habitual mind tells us what to reject and has a way of making you question everything. What is truth and fact and sheer magic? Maybe it’s a faith that we don’t know.